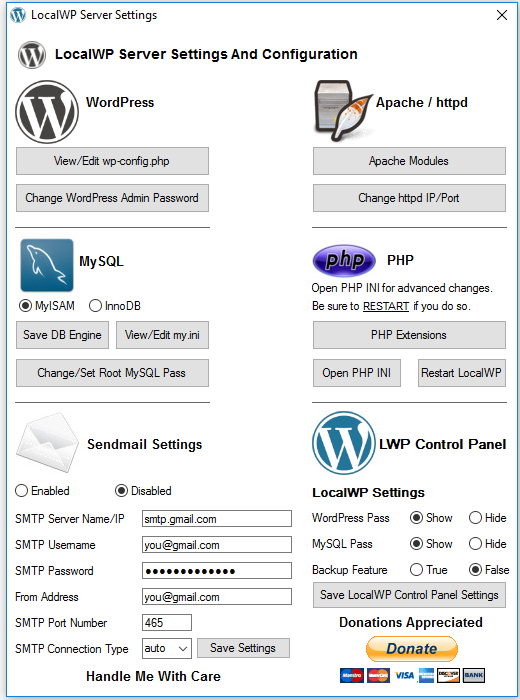 LocalWP short for Local WordPress / WordPress localhost is a free custom Windows Apache MySql PHP stack. It is designed so you can start using WordPress on your local Windows computer in a matter of minutes. All you need to do is download the .zip. Extracted it, start LocalWP and enjoy WordPress! You don’t have to install or configure anything like the database. It is pre-configured and ready to go. What can you do with LocalWP? Test new themes before using them on a live site. Try out new plugins so you don’t clutter a live site with waste. Maybe you want to practice editing .css or .php files before doing so on your website. To see if WordPress is really for you. Works on both 32 bit and 64 bit systems. We will be providing a single 32 bit version that will run on both 32 bit and 64 bit Windows systems. We had been maintaining both 32 and 64 bit versions. This was just way too time-consuming to maintain. A single 32 bit version will be much easier to update and maintain going forward. It is currently built and compiled with Microsoft Visual C++ 2012 (AKA VC11). You will need Visual C++ 2012 libraries installed on your computer. If you have a newer PC most likely you already have them. If not you can download and installed them directly from Microsoft with the link provided below. Download is a .zip file with standard/traditional packaging. – A PC with Windows Vista or newer. Both 32 bit and 64 bit systems are supported. – A minimum 202 MB’s of free hard drive space for files (Allow additional free space for testing). – The majority of the space used/required is consumed by Apache, MySql, PHP, and phpMyAdmin. You can extract LocalWP anywhere on your computer. LocalWP is a portable application, which means it does not rely on any Windows system files. All you need to do is make sure that it’s closed (not running) and delete the folder that you extracted it to. 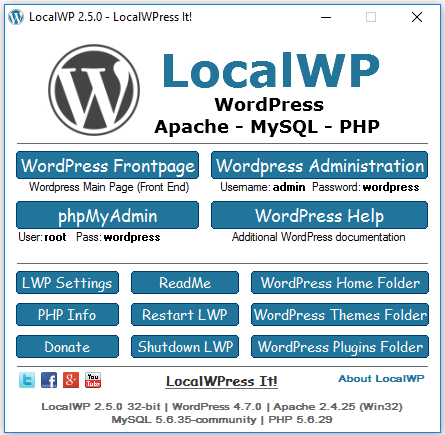 Once you start up LocalWP you can begin using WordPress right away. There is no database to install, and you don’t need to make any Apache, MySql, or PHP changes. They are all pre-configured and optimized for WordPress. As soon as it starts up you just click on “WordPress Frontpage” or “WordPress Administration” to start using it. To shutdown LocalWP simply click on the Shutdown LWP button or (X) it out to close it. LocalWP is a portable app, which means it will run from any folder/location on your computer. Even an external flash drive. &xrarr;More … Options when clicking certain buttons!